Classic Publications is a name synonymous with quality historical publications and this new series of books is no exception. Lavishly illustrated with the people, planes and maps of the birth of the Luftwaffe this book tells the story from the end of World War I up to and including the Polish campaign. This soft bound book contains 95 pages with over 200 photos and illustrations. The photos are mostly black and white. The illustrations include aircraft and geographical situation maps. This book differs from the Jagdwaffe series in that it concentrates on the geopolitical situation that affected the birth of the Luftwaffe and not so much on the aircraft. The aircraft are illustrated with the same illustrations from the Jagdwaffe series. This is not a bad thing as the profiles look great even though they are slightly smaller than the ones in the Jagdwaffe series. They are still quite useful. The photos are clear and mostly black and white. The book actually starts at the end of the First World War with the end of hostilities and the expansion, yes expansion, of the air force. It took many years for the German air service to demilitarize. We are treated to the likes of Goering, Kesselring, Richtofen, Milch, and the rest of the higher echelons. It is interesting to see the political in fighting that took place between leading characters of the Luftwaffe. It makes you wonder what would have happened if Wever didn’t get killed. Would World War II have turned out differently? The book is written in an easy to read manner which is very nice when dealing with politics. I especially liked the section on the Spanish Civil War. It explained the build up and the whole concept of the civil war. The text and photos made it easy to understand. 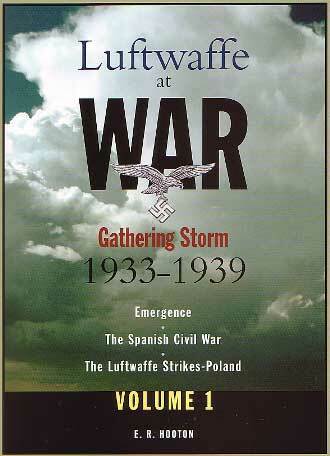 For those who want to round out their history of the Luftwaffe this book, and the rest of the series, is an easy way to do so. I personally can’t wait for the rest of the series. Between this and the rest of the Jagdwaffe series you will have a very good reference set. I obtained my copy through www.aeroplanebooks.com . They were friendly and quick. Let them know you heard about it from here.